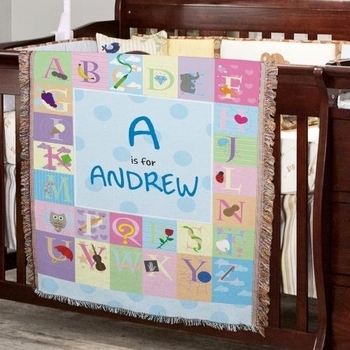 A memorable gift to treasure for years and years, this blanket promotes mastery of the alphabet and self-esteem with baby's initial and name on prominent display. Blankets are customized to order, so processing time takes up to 4 business days, but it's entirely worth the wait! Measures approximately 54 inches x 38 inches and made of a 50/50 cotton/poly blend. Fringed trim. Machine wash in cold and tumble dry on low. Please Note: the coloring and size may vary slightly due to the hand-made nature of this product.